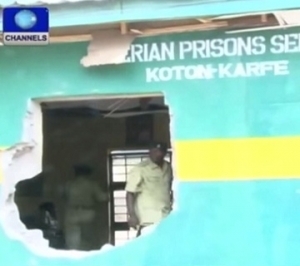 Reports say a prison break has occurred at the Koton Karfe Medium Security Prison in Kogi State. The incident occured at about 7.10am on Saturday. About 13 inmates are said to broken their cells and escaped through the fence. Three of the 13 are convicts. This is about the third time a prison break is taking place at the Koton Karfe Prison.